When you type the word commitment into Google search two definitions are provided the first, “the state or quality of being dedicated to a cause, activity, etc.” The second definition Google provides, ” an engagement or obligation that restricts freedom of action.” I laughed when I read the definitions provided because it hits both ends of the spectrum of how people most often view commitment. Either it is viewed as a form of devotion to a cause or individual, or it is perceived as a kind of imprisonment. 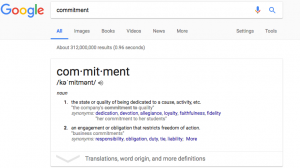 I began researching the topic of commitment after I overheard two ladies talking in the lunchroom at work. One woman, Stephanie (names are changed) was asking the other Kara, when and if she thought her boyfriend of four years would be proposing soon. Kara, responded in an annoyed tone, ” Who knows? Every time I try to bring it up, he changes the topic.” Stephanie looked at Kara concerned and asked, “Well you know he wants to get married right?” and Kara just shrugged. This exchange is not uncommon for women who are with a guy for some years to have with other women. But, there are several points about this lunchroom exchange that are worth pointing out and discussing further. Is it concerning if a guy changes the subject every time marriage is brought up? Not necessarily, there are many reasons he could be dodging the conversation that you should consider. Financial Security. It may be a gender stereotype, but men want/like to provide for their families. Many guys feel it is important to be secure enough financially before asking his girlfriend to marry him. If he has debt from bills or student loans, he may not feel stable enough to take on ring payments or wedding payments. 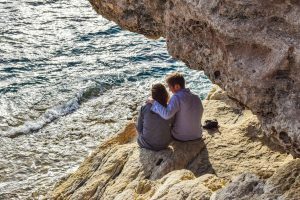 He may also feel frustrated by his financial situation, and he keeps changing subjects when marriage is brought up because it may be difficult for him, especially if he knows his girlfriend is ready for that step and he can’t provide it. The Vision in his Head. The guy might have a particular idea in his head of where he would like to be in his life when he finally does pop the question. He may want to buy a house first, or to go along with financial security; he may want to pay off a particular debt he has accumulated or meet a set savings goal. Uncertainty. There is a chance that the guy may not feel ready for marriage. It may have nothing to do with finances or the vision in his head. Many guys I know that have parents who are divorced or that had difficult marriages have expressed uncertainty about matrimony because they are not convinced marriage works. Or it could just simply be he’s not ready with no reason as to why – which is okay! Engaged vs. Marriage. A guy once told me he knew his girlfriend was “The One” and that he felt like they were both ready to take the next step and get engaged. However, he felt they were not ready to be husband and wife. He said he was concerned that the moment he popped the question the wedding train would leave the station and nothing would be able to slow it down. I didn’t understand at the time that engagement and marriage were different stages in a process. I saw them as one whole part. I didn’t get it until I became engaged myself. What he was saying and what I learned from my experience is that he wanted a transitional period and not to jump from one thing to the next without giving each stage its due time. More men may feel this way, which is why they are hesitant to get down on one knee because once they do their loving girlfriend will go straight to bridezilla in no time. How can a woman get to the bottom of what her guy is thinking and feeling? The most concerning part of the lunchroom conversation I overheard was the last question Stephanie posed to Kara, “Well you know he wants to get married right?” to which Kara just shrugged. If you have been together for a significant amount of time and you are not aware of whether marriage is even on the table that’s an issue. Especially if marriage is important to you and something you want. The best way to find out is to ask him directly. 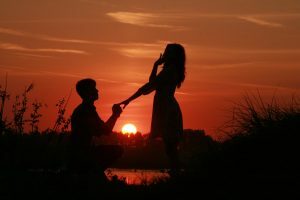 Your boyfriend may think you want to get married immediately and you may want a longer engagement. Your boyfriend may want to pay off his car first or buy a house. You don’t know unless you ask him. However, you need to prepare yourself because there is a chance that the answer you receive isn’t the one you want. A theme you will consistently see in many of my posts is that I firmly believe that communication can solve most any problem a man and woman face in their relationship. Figuring out where you stand on commitment is absolutely something that should be communicated. This entry was posted in Girlfriends and tagged boyfriend, commitment, girlfriend, love, Relationships. ← You are the Best Thing, that ever Happened to Me! Enter your email if you'd like us follow up with you.